The 411 While Montreal is known for some stand-out restaurants, often there are places that will do a diner service but not be open for brunch. I often wondered how they would approach a brunch menu, and am glad to see Restaurant Les Cavistes has taken up the challenge. 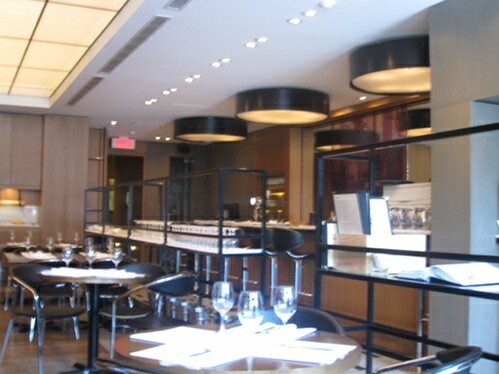 Best described as a French bistro placing an importance on wine, I have been following Les Cavistes for years. They even temporarily tried out brunch during the Festival en Lumière and I was quite pleased. So when I heard that they were bringing it back I felt it would be interesting to see how a French bistro handles brunch. At 1st glance With a terrace and a well-lit interior, Les Cavistes warmly welcomes you in. With a capacity for 50, give-or-take a little, it’s great for a table for two or a special occasion group that requires reservations. We were curious about some of the appetizers, like the oysters and scones. To be honest, at $2.50 it’s a nice little splurge and not too much damage to the budget, especially considering it is an oyster, and in the case of the scones they do serve two. 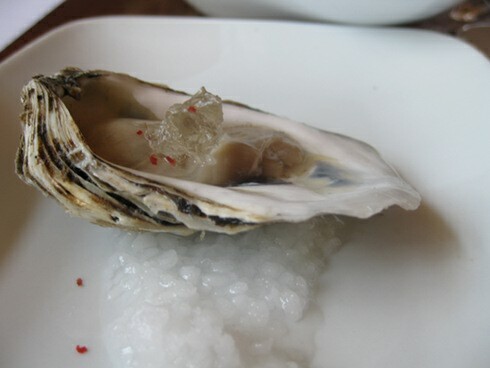 Now I’m not an oyster aficionado, but what I do know is that I liked it and it fit with the menu. 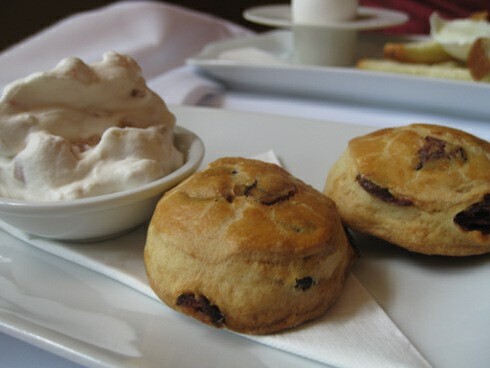 The scones were a tad dry, although, to be fair, most scones that I’ve had tended to be so. The cream, however, was very plentiful, so much so that I had used up all the scones and was relegated to scooping it up with my spoon. If it wasn’t a classy place I would have licked it off the plate, it was that good. Overall, the cream was brilliant; it was light and had a refreshing hint of fruit in it. So now comes the main dishes: my friend had the omelette ($12.75), which in essence is a vegetarian dish since it is meat-free and included a side of salad. I should note that this ceases to be a vegetarian option when you add the lardon (pork cube) for an extra $2.50. This omelette was actually quite large, which I was not expecting, each bite was bursting with taste, and in the end quite filling. Although I’m not a fan of salad as accompaniment on a brunch meal, this was expertly done and deserved to be on that dish. Next came the soft boiled egg and half quail. I was expecting this to be the most filling dish since you do get meat from the quail and, although being a small bird, it seemed like it would be a good value for under $10. 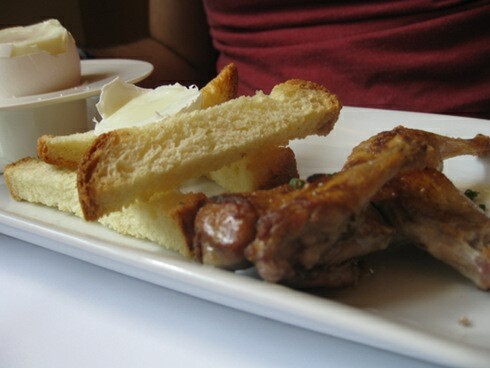 This dish was not the largest when it arrived; there was a soft-boiled egg and some bread. The quail piece was not overly large but, as previously mentioned, it is a small bird, so in hindsight I should have known better. Granted, it clearly delivered in the taste department, but just don’t expect a hungry-man platter. 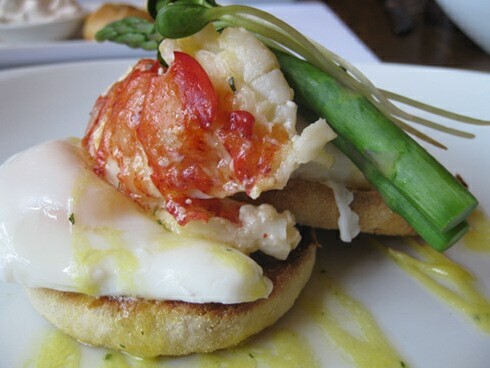 Lastly came the lobster Benedict which offers two English muffins, eggs and a very generous chunk of lobster. In fact, when I look at the price of a lobster Benedict being sold at other places, I am shocked that they offer it at so low a price. The lobster part was great as it was everything a nice chunk of lobster should be. The English muffin was a touch crispy, and while I like some firmness in my English muffins this was a little too much crispiness for my taste. The eggs and sauce, however, were spot on. It also came with asparagus, which went well with the plate. I should mention one discrepancy: the price listed on the site for this dish ($17), which was confirmed the day I went and the day I wrote this review, now seem different. The physical menu lists this plate as $17 & $28 (this is confusing, and no, it doesn’t make sense to us either), yet my bill shows a total of $18. To further confuse the situation, note that three of us each got TWO eggs Benedicts, so either there is a mix-up on the menu or the waiter made an error in our favour. That being said, the reality is that $18 for two lobster Benedicts is a great deal, and get it while you can. Our waiter was excellent, did a great job in explaining the menu, and did not rush us as we sat around a while after all our food was done. There are a few items on the menu that are vegetarian-friendly, although the majority of dishes do have meat in them. 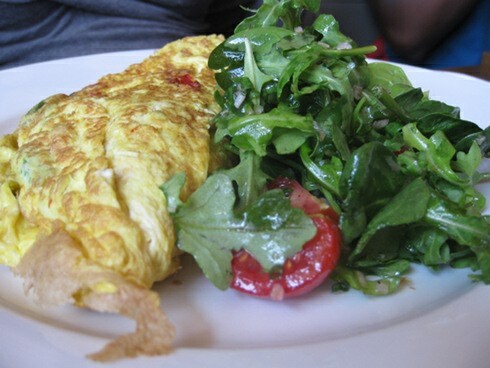 The above mentioned omelette is quite filling, so it’s a nice option to go for. The dishes were well plated, tasty and a nice way to get a bistro inspired brunch. You may need to get an entrée or two if you have a large appetite. The price of the lobster Benedict was amazing (if it wasn’t an accident), although I can see how your bill can climb, especially when you factor in coffee at $2.45 -$4.45 with no refills.